Townie Wife was amused by Countryfile last Sunday, when three Londoners visited Adam Henson’s farm in the Cotswolds to get a taste of farm life. Young Annabelle Spranklen was worried that a shock from an electric fence might turn her hair grey, and preferred the size of chickens to cattle- something I can definitely relate to. Annabelle also felt a bit weird about having dirty hands- which was something I had to get over too. Once you’ve got into the messy business of lambing for a few weeks, however, you get desensitised to that “ikky” feeling. At least I didn’t tiptoe around the cow pats in pink flowery wellies on my first visit to the farm- I strode boldly ahead in my new shock-absorbing green Aigle boots (in for a penny, in for a pound) and never veered to the right or the left. I’d had a tip-off from a friend in the country (thanks John H). Things have been pretty quiet here lately, except when our two breeding bulls managed to end up in the same field (one of them did an SAS-style raid on a fence). A scrap ensued and Pete had to rescue the older bull, who was worn out from all of his recent conquests and came off worse. Male pride dented, the beaten bull refused to look any of us in the eye for days, and hung his head in shame. His reaction was almost human, and we felt really sorry for him and gave him some TLC. One of the cows helped, by licking his face, which Pete reckons was quite unusual. 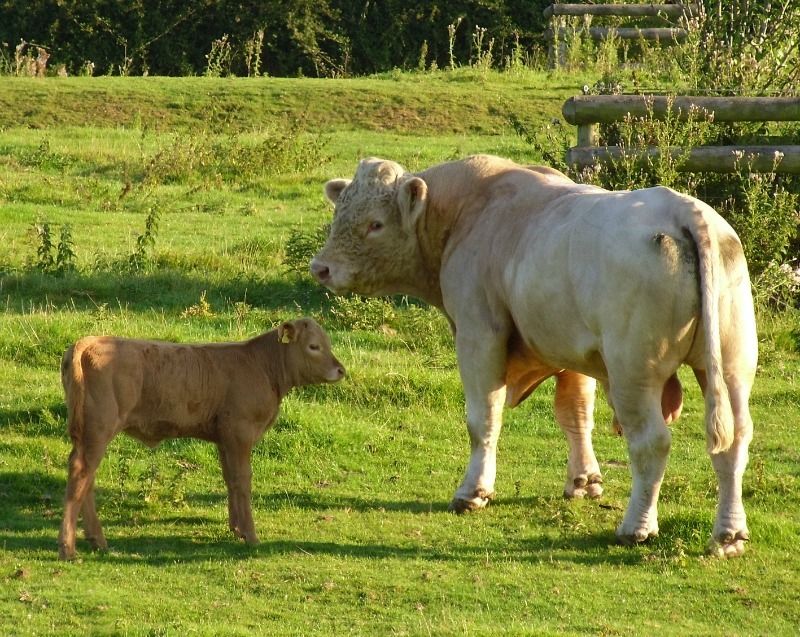 As you can see from the above picture, the mountainous Charolais is back to normal now and enjoying life with his “family”. I’ll end this post with another pic (taken here at the house a few days ago) showing a rainbow after a storm. Rainbows are a symbol of hope, and while uploading my photos I couldn’t help thinking of, and praying for, the desperate families in Gaza and Northern Iraq. Images of extreme suffering have been etched on my mind for the past fortnight, in stark contrast to the peace and beauty of my own surroundings. I have no answers, only a million questions. 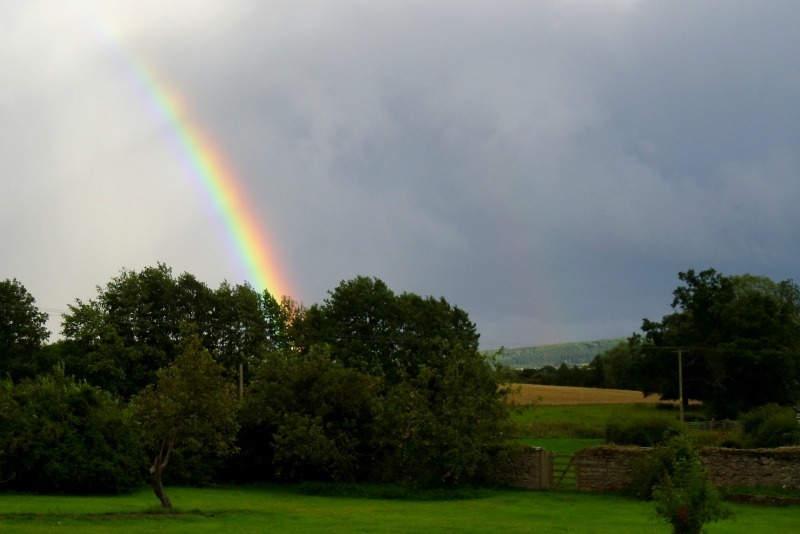 Categories: Farmhouse blog | Tags: Charolais, Countryfile, prayer, rainbow, townies | Permalink.